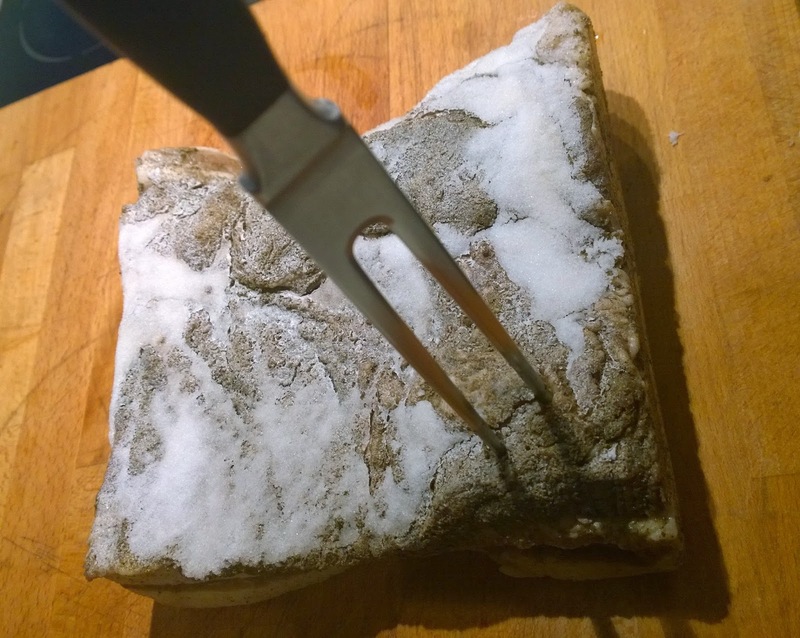 A long time ago I did commit to providing an update on the Lardo Project. Well, here it is! The first attempt failed due to a few reasons. First of all I thought that keeping the ripening lardo in the basement cabinet would be cool enough. Also, the amount of salt applied to the batch was too little. What I ended up with was an ugly greenish looking slab of mould - that one went right to the bin. But I didn't want to give up and went out to get another batch - this time I went for a slab of bacon from a happy free-range organic Mangalica pig. With plenty of salt on top of the seasoning mix it went into my drinks fridge. I did visit it a few times to make sure that there's enough salt crust, I did turn it once without straining the brine and did reapply some more salt after that. Overall, I let it rest in the crust and the resulting brine for a total of four months before taking it out - no mould this time. 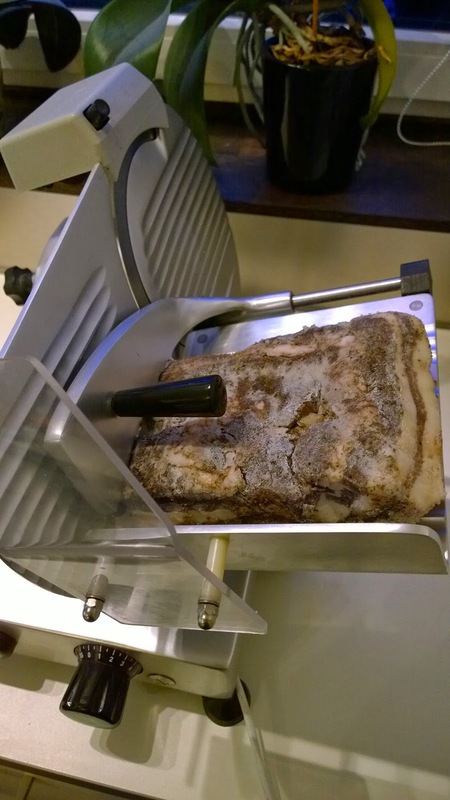 Full of excitement, I was ready to remove the salt crust making sure to also clean out crack and wrinkles and dry off the remaining brine before throwing it onto the slicer and getting the first slices cut. I tried different thicknesses and came to the conclusion that 1,25 mm is the perfect thickness for my Lardo. In the meantime, the first successful batch has been eaten and I have just successfully finished another one a few weeks ago. I also found that it tasted very good with some home made whole-grain rye/wheat bread. Last but not least, I did some reflection on the naming and figured out that calling it "Lardo" is maybe not 100% appropriate due to several facts. First, I was not using the marble pots. Secondly, I am not living in the associated regions in Italy, but in a small Bavarian village along the Via Julia with a historic Celtic site. 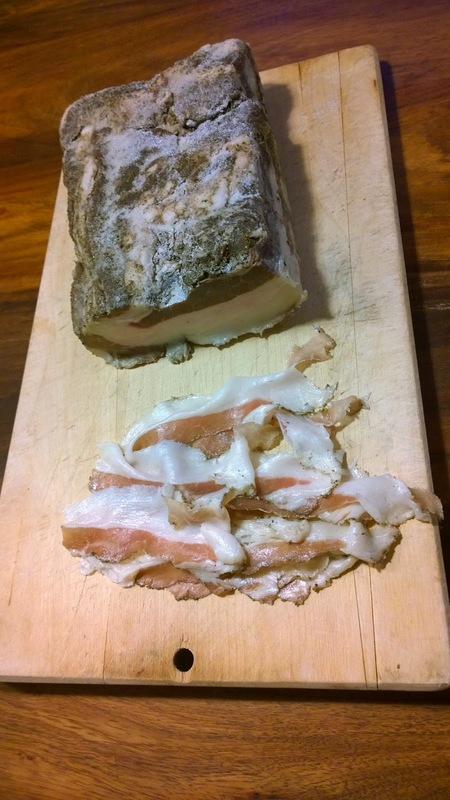 Also, some research showed, that this sort of raw bacon is common in many areas also north of the alps such as Upper Austria ("Kübelspeck") and even as far east as the Ukraine. So, I decided to call it "Celtic Bacon" from now on.